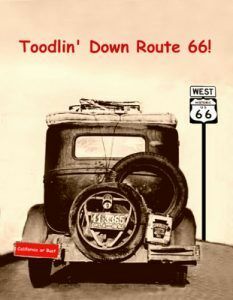 Toodlin’ Down 66 Postcard by Kathy Weiser-Alexander. Available at Legends’ General Store. The often romanticized Mother Road inspires in many of us a nostalgic bone which niggles at something buried deep within us. While some may see Route 66 as a link to our parents and grandparents, others perhaps feel the sense of freedom that the road provided to those early travelers. And then, for those of us that live continuously in the nostalgic past, the Mother Road is, but yet, the next adventure beyond the Santa Fe Trail. Whatever the reason, the Mother Road is an experience, a feeling, a perception, a taste of sight and sound, and a mystery that can only be resolved by driving the pavement itself. The “super-highway,” as it was thought of in 1926, represented unprecedented freedom to travel across the American West. 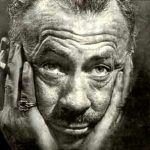 Spawned by the rapidly changing demands of America, entrepreneurs, Cyrus Avery of Tulsa, Oklahoma and John Woodruff of Springfield, Missouri conceived of the grand idea of linking Chicago to Los Angeles and began lobbying efforts to promote the new highway. 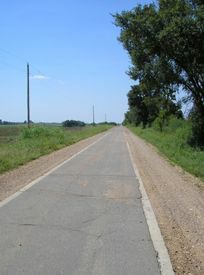 While other East/West highways existed at the time, most followed a linear course, leaving out the rural communities, dependent upon transportation for farm products and other goods. No doubt a daunting task for the pair, the federal government finally pledged to link small town U.S.A. with metropolitan capitals in the summer of 1926, and the American Association of State Highway’s designated the road as U.S. Highway 66 on November 11. Unfortunately, a few years later, the depression came, halting progress on the new “Super-Highway”. However, in 1933, thousands of unemployed men were put back to work and road gangs paved the final stretches of the road. By 1938 the 2,300 mile highway was continuously paved from Chicago to Los Angeles. When World War II broke out, Route 66 proved to be invaluable in transporting troops, equipment and products across the vast West to California, where the government established multiple industries and armed force bases. When the war was finally over in 1945, the Mother Road served to transport thousands of troops home. Almost immediately, the tourist industry began to grow, giving rise to countless tourist courts, motels, service stations, garages and diners. However, the excessive truck travel during World War II and the ever expanding automobile industry had left the Highway in appalling conditions, with narrow pavements and poor road conditions. 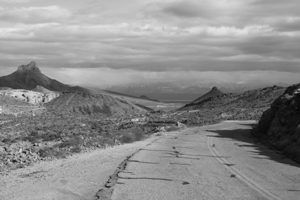 Sitgreaves Pass Arizona along the pre-1952 alignment of Route 66. Photo by Jim Hinckley. Click for prints, downloads and products. In the mid 1950s the public lobby, along with President Dwight D. Eisenhower, were demanding a federal sponsorship for a system of divided highways, and on June 26, 1956, the Federal Aid Highway Act was passed by Congress for a national interstate highway program. The act, also known as the National Interstate and Defense Highways Act, allocated over $30 Billion for the construction of over 40,000 miles of interstate highways, the largest public construction project in U.S. history at the time. On June 29, Eisenhower signed it into law. While it is remembered by many as Eisenhower’s greatest domestic achievement, the flip side was the demise of small towns along highways which connect more isolated parts of the country. With the highway act, Route 66 was doomed. Doomed or not, by the 1960s, many points of interest were familiar landmarks to a new generation of travelers, and the television series “Route 66” was aired “driving” the Mother Road into homes all over America. Though the series created great interest in the American public, it was to be short-lived, as by 1970, nearly all segments of original Route 66 were bypassed by modern four-lane highways. By 1984, all of the poorly maintained vestiges of Route 66 had completely succumbed when the final section of the original road was bypassed by Interstate 40 at Williams, Arizona. Kathy Weiser-Alexander. Click for prints, downloads and products. 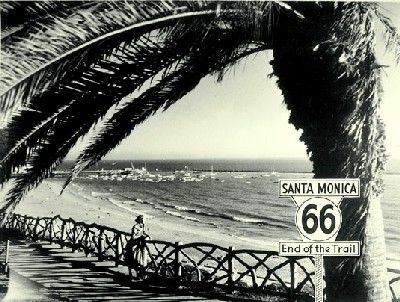 As Route 66 was decommissioned on June 27, 1985, its signs were removed and the Mother Road was almost lost. Even to this day, the Mother Road appears on very few current maps. Most states have installed Historic Route 66 signs along portions of the road, but, unfortunately, they rarely give exit directions where the road so very often veers off from the interstate highways. Obviously, the route today is not what it was in the past. The sights and sounds of the Mother Road change daily with the emergence of new businesses and development along the old highway. You will want to take a lot of pictures, because what is here today might be very well gone tomorrow. However, much is preserved and the Route 66 Historical Associations and private groups have done alot to preserve these vintage treasures. As you travel along, you will often see a sign or marquee of the vintage road as these icons of history are preserved, though their buildings are long gone. In June of 2018, the National Trust for Historic Preservation included Route 66 on its 11 most at risk sites that highlights architectural and cultural spots it deems in danger from development or neglect. Meanwhile, the Mother Road is up before congress for designation as a National Historic Trail (as of June 28 no action taken). Traveling the road, you will experience everything from the frustration of finding the route in a metro city to being pleasantly surprised by the next small town that you venture into. The landscape quickly changes from the hustle and bustle of metropolitan area, to quiet meandering roads, to tall grass prairies, where you feel as if you might be the only person left on earth. While it’s a good idea to plan your trip, because the road can be confusing, the whole idea is to experience the Mother Road. 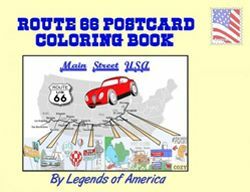 Our advice is to get a couple of really good Route 66 books and some good maps before you begin your adventure. Here and there, some places will give you a road sign when the road veers off the interstate, but mostly not. Even with a few good maps, you will, no doubt, take a wrong turn once in awhile. Take the Business Loops off the interstates when possible – they will often lead you to your photo opportunities of our scenic past. Such is the experience!! Enjoy the ride! Route 66, produced by Kathy Weiser-Alexander, December 2013. View on YouTube HERE. 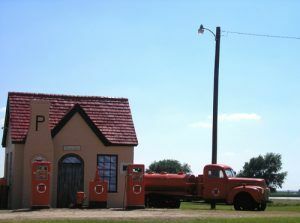 Restored 1927 Phillips 66 in McLean, Texas, September, 2007 Kathy Weiser-Alexander. Click for prints, downloads and products.